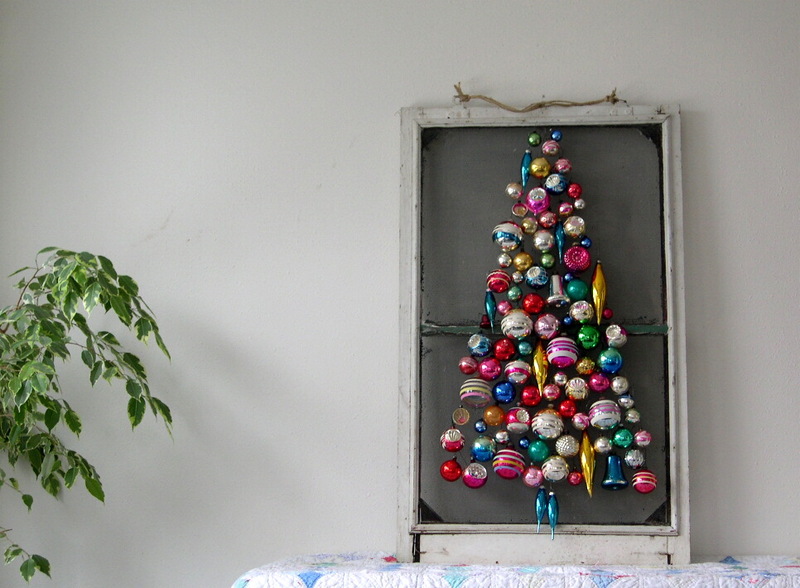 Several months ago I came across this vintage Christmas ornament + screen door photo on Linda's blog, My Vintage Soul, taken while on her junking / pie-eating adventure in Syracuse, New York. Remember these? I know I do because they've been hanging out in my dining room for quite some time now. I taped some string to the frame of the screen to act as a guide for the shape of the tree and then just poked the wire ornament hangers through the screen. I didn't have enough ornament hangers so I ended up using pieces of pliable wire and that seemed to work much better -- the wire made it easier to adjust the height of a hanging ornament without having to take it out and poke it back in twenty times in an effort to position it where it needed to be. The ornaments seemed less likely to to fall out too because I scrunched the wire on the back of the screen. I didn't take a photo of the scrunching. 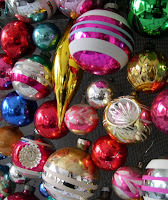 In other vintage Christmas news, I hope you'll enter my vintage Christmas giveaway over here. Thank you, Linda, for the use of your photo. WOW!! I am in love. My heart skipped a beat. Too cool. Beyond clever. Thanks so much for sharing. Oh my goodness!! I love it! I'm trying to write a comment as clever as your idea but I don't think it's possible. I saw the same photo (I may have even seen the actual screen door, depending on which of Linda's adventures it was) and nothing at all dawned on me. Excellent work, Into Vintage. Excellent work. That's genius. It needs to be in a magazine. Oh my gosh, I think my heart skipped a beat too! Way to take an idea and improve it about 100%. It's FABULOUS! This is the most brilliant use of vintage ornaments this year!! I absolutely love it!! Oh.my.goodness. I am in love. That is the gosh darn cutest thing I have seen in a long while. I love it! Love it! I thought it was pretty cool when I saw that screen door but your take on it is fabulous! 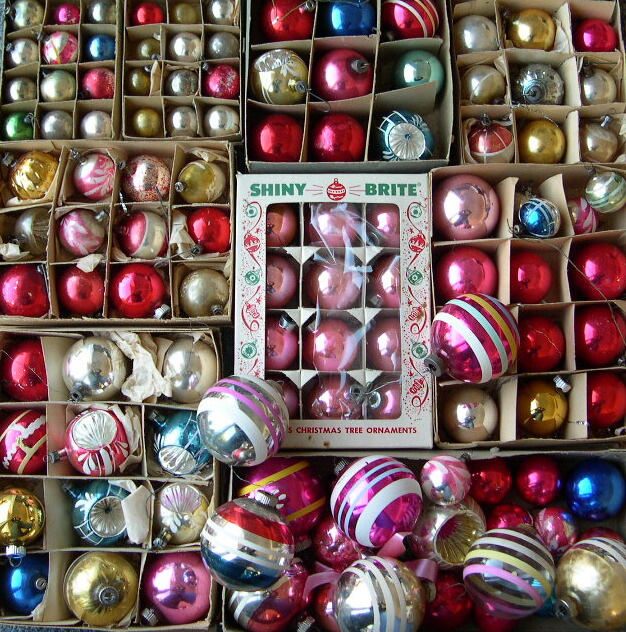 Your boxes of ornaments look like the ones that have been hanging in my hallway for weeks -- perhaps they're related? Great job! I'll give you a tip for yet another project: it is also fun to use broken ornaments, upside down, inside out, etc. - it gives a splendid result also. Merry Christmas with your cheery tree! This is just sooooo cool! You are a true visionary. Love it. I get lots of decorating magazines delivered to my door and have a pretty good collection of decorating books. Your idea is BY FAR the coolest thing I've seen. I love it! Oh shucks. I have to do this now. :D Brilliant! I LOVE it! 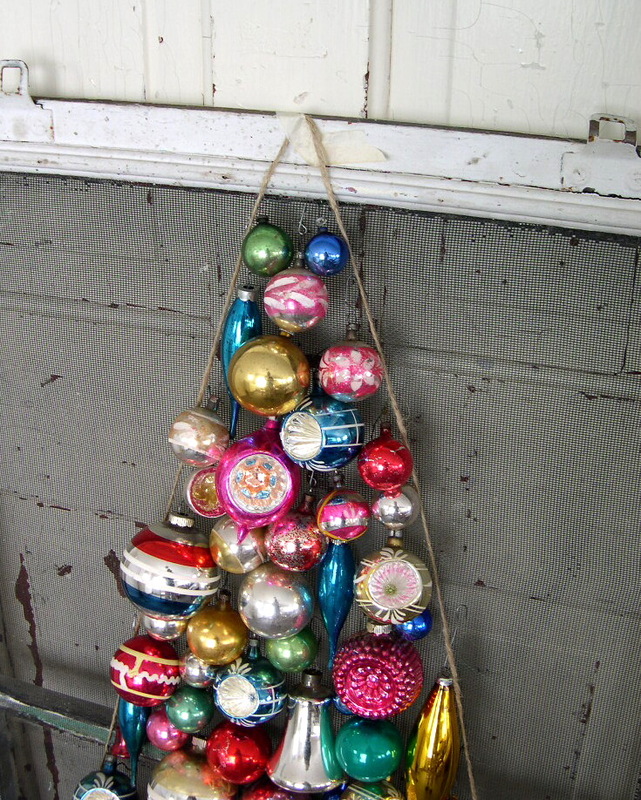 :-) Can't help but smile seeing this vintage ornament tree. That is so cute. Makes me want to run out and find a screen. That has to be the coolest Vintage Christmas idea I have seen in a long time!! Very original and such simple beauty!! Okay, I'm having a fit. That is just too darn cute!! I love the tree shape~ absolutely brilliant!! I saw the screen too and thought it was fabulous, but you took it to a whole nutta level. Wow. Your idea is going to be all over blogland before you know it. Mark my words :) Genius! Dang that is clever! A-D-O-R-A-B-L-E! I love this project! So fun! Great idea, love the intensity of colour, shininess and sparkle! This has got to be one of my FAVORITE Christmas ideas ever!!! I've been lusting over an old screen door at one of our local antique malls....I may just have to go get it now! Absolutely ingenious..i LOVE it to bits!! LOVE this, such a clever and easy idea :D I found you from Apron Thrift Girl's "Make Share". Love your vintage crafty blog. Came over from Selena's Make Share. :) That is really gorgeous! What a great way to really focus on the Christmas ornaments, too. This is fabulous! I love that you made the tree shape with the ornaments. Oh, it's BRILLIANT! Vintage ornaments are my absolute favorite!! Lots of photos on my blog, and if you hurry, you can enter my giveaway, too! Seriously, that is beautiful and needs to be in a magazine. What a great idea. You certainly have an eye for design and I just love visiting your blog. Everything you create speaks to me. Have a wonderful day! How's that for a winning combination?! The upside? I'm getting very comfortable with this "I always want to copy Amy" feeling. It's my constant companion. Amy...Seriously....BRILLIANT. I love it to death. Happiest of Holidays to you too, Friend! 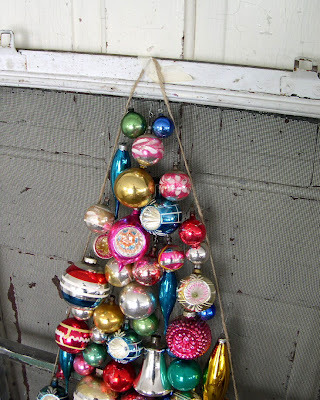 Oh Amy I ADORE it....I just wish I had a screen floating about to try this myself....Heaven ONLY knows if I put ALL the mercury glass balls I have on my tree it will topple over....hahahahaha....! THANKS for sharing this Lovey....You are just TOO clever....!! Gorgeous! "The Garage Where Cars Can't Park"! I have one of those too! You are a genius! That looks so fun, vintage, funky, and fabulous! I love it! Could you BE any more cleverer? I love this! Oh, and being able to park your car in the garage is seriously overrated! So unique and creative..love this! So, I'm a little late to the comment party, but I did want you to know that what you did with my simple screen door is really great. If only I could inspire my children in a similar way. Cute, cute idea!! And the best part....no vacuuming up the pesky pine needles. What a fantastic idea! Your ornament tree is faboosh! I'm new here, this is my first visit to your blog. I came looking after visiting my friend Jill, I've been to her "little nest" and seen your creations in person, oh, they are just wonderful! I'm off to peruse more of your blog and pop into your etsy shop as well. I love all of the colorful ornaments on the old screen very cute. I see these doors and think they are cute, but have never come up with an idea. Too cute. Amy.....let me know if you are going to be down my way. I would LOVVVVVVVVVE to meet you!! How cool is this?... I've never seen this before, what a great idea, LOVE IT!! Thanks so much for linking up with VIF! What a fantastic idea! It could be adapted to any celebration with hanging decor, too. YOU are SO clever! I LOVE it! This is totally cute, love it! This is the cutest thing! 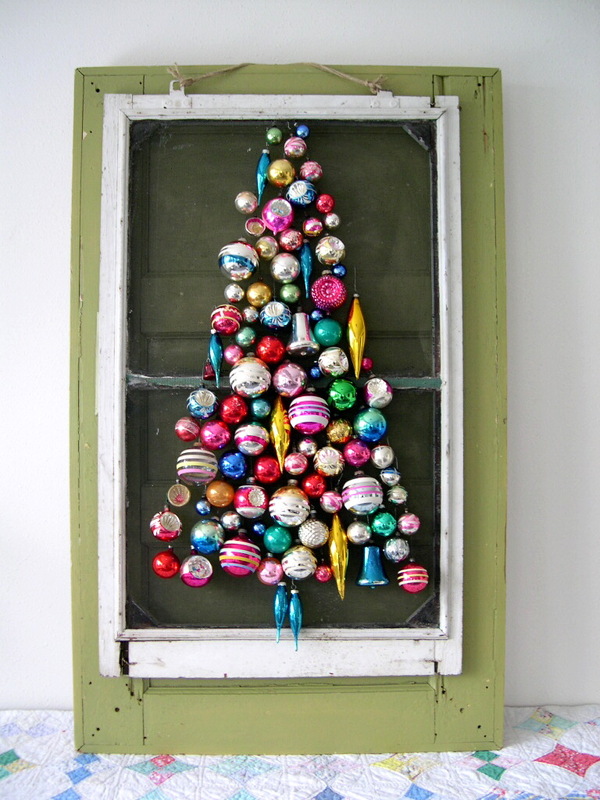 I love it - you could even add christmas cards to decorate around the edge of the frame! Neat, have a very happy holiday! I just found your site and I know I will be back. Love this idea, hope you don't mind me stealing for personal use. 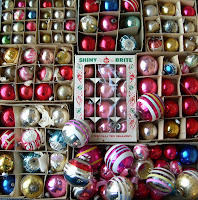 I've got boxes upon boxes of vintage and 3X (at least) of modern ornaments. Enough to do 8 full-sized trees. I have been obsessed with this ornament tree and your blog or the few weeks since I found it. 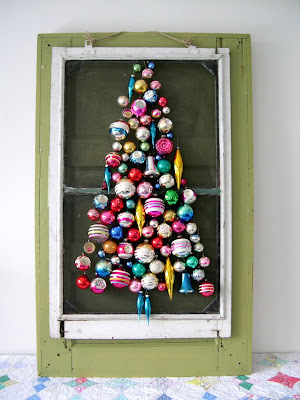 I have plenty of vintage ornaments and I will be giving this a try on the screen of our back door. Oh,I hope it turns out even half as amazing as yours. Loooove your blog!!! I took your idea but, instead, stapled screening material to a large open picture frame and then hung the ornaments on that. I put one over my mantle and hung one on the wall on my front porch. Many thanks for the idea!!!! I was just getting ready to post exactly the same thing. 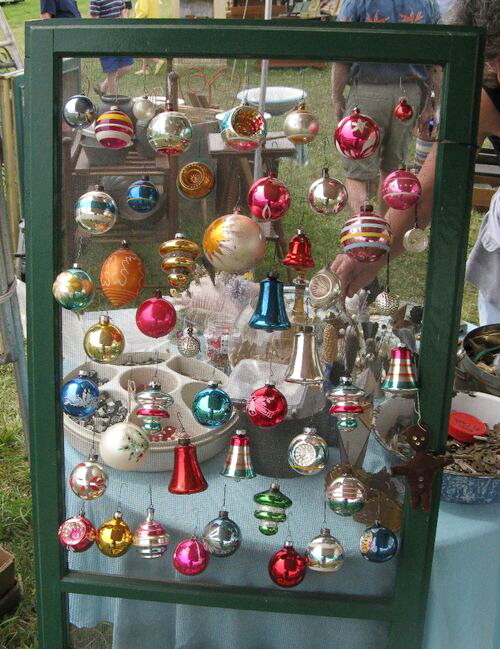 I am going to buy a large vintage frame, staple some window screen into it and use the vintage ornaments left to me by my mother from her and my grandmother. PLUS SIGN ++++ just great! What can I say that someone hasn't already said? This is beautiful and just perfect.....this is by far the best idea I have seen to-date for creating a real vintage, flea-market style decoration. Wonderful!!!! Clever,I saw a picture that was done on the same concept only old jewelry was glued on a black felt background old jewelry earring pins u name it all had stones of different color and size this was hot glued into the shape of a Christmas tree on the black felt backing.This was made by a woman back in the 60s it was hanging on the wall with a spot light on it the jewels looked magical probably 16by 20 frame if u have or collect old jewely with stones and pearls this would be a get project the outcome is fantastic. I'm going to do this but think I will first string some mini Christmas lites back and forth and in tree shape then add the ornaments, I love my lites. Gorgeous work, creative and colorful. Thank-you for sharing your work. Beautiful! What is the dimension of the frame, so I get an idea about the size of the whole thing?